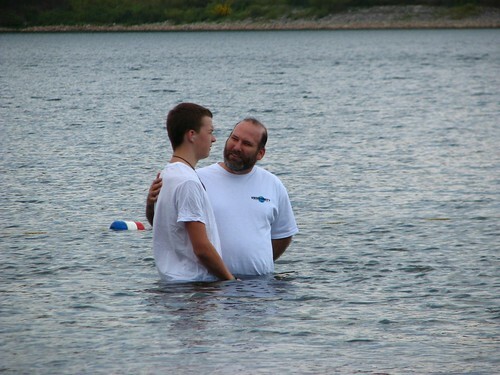 Jesse's Baptism, a photo by paynehollow on Flickr. This morning’s story is a rather odd one [Exodus 4 - God's attempt to kill Moses! and Moses' son's subsequent circumcision/foreskin sacrifice!!]. As we look at it, we might find it helpful to remember what John Dominic Crossan says about the Bible. He says that the Bible is a dialogue about what God is like. On the one hand,you have a picture of a God who is violent and retributive, in other words, a God who punishes those who are bad and rewards those who are good. On the other hand, you have a picture of a God who is non-violent and distributive, in other words, a God who loves everybody, not just the good people, not just the people of Israel, but all the nations, of a God who gives equally to all, who created the earth and its bounty for everyone, who throws a great big feast to which all of the nations come streaming to taste of God’s goodness and mercy. Both of these pictures of God run through the Old and the New Testaments. It’s not that, as we used to say, there’s a God of the Old Testament, and a God of the New Testament. Both of these pictures of God run throughout. There’s a tension between the two views of who God is, because it can’t be both ways. There are, of course, a lot of people putting a lot of time into developing theologies that explain how God can be both violent and non-violent, but God can’t be both: one precludes the other. As Christians, of course, the clearest picture that we have of God is through the person of Jesus Christ, and Jesus shows us the God who, in his words, causes the rain to fall and the sun to shine on the just and the unjust, not the retributive God, but the God who loves everybody equally, the God who is like the father who forgives the prodigal son before he can even say, I’m sorry, the God who is like the employer who pays the workers who show up at the end of the day the same wages as the ones who’ve spent the whole day working their fingers to the bone. So the Bible, says Crossan, is a dialogue between two visions of what God is like. This morning’s odd story falls on the side, obviously, of the violent God, as will some of the other stories that we look at over the next few weeks as we continue on through Exodus. And this particular story has always struck me as so very bizarre that I’ve chosen to ignore it. You’ll not be surprised when I tell you that it’s not one of the lectionary passages, which means that a whole ton of other preachers also ignore it. But in the book, Freedom Journeys, Rabbis Arthur Waskow and Phyliss Berman have wrested a meaning from it that I want to share with you. But first let me mention the more traditional meaning, which is that circumcision is so important to God that God is ready to kill Moses because either he or his son, or maybe he and his son are not circumcised. The pronouns here are not clear, though it’s usually translated that Zipporah takes the foreskin of their son and throws it at Moses’ feet. It’s not clear whose foreskin it is, or whose feet it gets thrown at, Moses’ or God’s. It kind of just seems to be stuck in there. It doesn’t flow well with the rest of the story. Moses is God’s chosen, on his way to free the people of Israel. You’d think that God wouldn’t want to kill him. You’d think that God might have mentioned something about circumcision back there at the burning bush, and by the way, circumcise your son, or yourself, which ever, while you’re at it, before you head off to Egypt. Maybe that’s the missing part of the story. Maybe God did tell Moses to do this, and Moses resisted, you can’t blame him, and now God is angry at him. At any rate, the most traditional meaning of this story is that it’s a story that underlines the importance of circumcision as a Jewish rite. These stories were written down during the Jewish exile in Babylon, so it would have served as a reminder to the Jews who were being tempted to take on the ways of the Babylonian empire, who were under great pressure to assimilate, to just fit in, to remain faithful to their traditions. But these rabbis that I mentioned have wrested out another meaning, as well, and that is that once Moses faced death at the hand of God, that he was never scared of anything again. I mean, if God tries to kill you, and you live through that, then really, who are you going be afraid of? Seeing Moses’ pale, gaunt face imbued with terror, trudging hopeless on the path to death, God knew he had to slay this terror-stricken Moses, had to kill the terror that was already emptying out Moses’ life, making him impotent to face Pharaoh and free the slaves. Facing a God on the brink of killing him was Moses’ cure. Facing immediate death, he knew a Power more powerful than Pharoah. His terror burned away, and he became the Moses about whom it is written, ‘Never again did there arise among the Israelites a prophet like Moses who knew YHWH intimately, face-to-face’ (Deut. 34:10). BUT, I do like the meaning that the rabbis have wrested from this ancient story. And obviously something happened in-between the time that Moses first talked to God, full of hesitation and excuses, but what about this, and what about hat, not me, Lord, and the time that he powerfully confronted Pharaoh. It may have been as simple as the fact that by the time he confronted Pharoah, he had his brother Aaron with him. There’s great power in numbers, right? He wasn’t going it alone anymore. At any rate, somewhere along the way, he became one of those seemingly fearless ones, like Gandhi, like Martin Luther King, Jr., like Archbishop Oscar Romero, like Sojourner Truth, like Nelson Mandela, like Jesus. And when I say “fearless,” I don’t mean that they didn’t feel or express fear. “Abba,” Jesus prayed on the night of his arrest, “if you are willing, take this cup from me.” I mean that they didn’t let fear guide their actions, they didn’t let fear rule their lives. And isn’t that what Jesus was after when he invited his disciples to take up the cross? He took the symbol that was most feared by the people, most adroitly used by the Roman Empire, who would crucify hundreds of people at a time right out there at the crossroads for everyone to see, leave them up for days as a way of keeping their subjects in line. It was a very effective tool. So Jesus took the symbol that most invoked fear and dared his followers to beat them to the punch. Take it on, pick it up, carry it around. Show them that they can no longer control you. Show them that you will not be controlled by fear. If any want to follow me, he said, deny yourself, take up the cross, and follow. Jesse, you’ve been following Jesus for some time now, and we’ve all seen that. We want you to know that your church family is well-pleased with you. For you have chosen a life, not ruled by fear, but by love. You have chosen a life that matters, that counts, not just for your own happiness, but for the joy of others. As you stir the waters of baptism today, we remember our own baptisms, and we pledge to walk alongside you on this journey toward the cross.